VALLETTA, Malta--(BUSINESS WIRE)--WSC launches a revolutionary soccer business offering both digital and real services in cooperation with a former member of the Brazil soccer team, Ronaldo de Assís Moreira. Ronaldinho Digital Stadiums will be developed in 300 locations including Asia, the Middle East, Africa and others within three years. The stadiums will be created using cutting-edge digital technologies such as block chain, AI and VR. Construction plans have already been confirmed in more than ten locations around the world. To spread the existence of these stadiums, a franchise chain (FC) system will be introduced and WSC will work in alliance with soccer-related business owners around the globe. Main services provided by WSC are listed below. Participation is open to all players from around the world including both professionals and amateurs. Super league will be held throughout the year in each country and region and a championship tournament will be held once or twice a year. Using video analysis technology which implements cameras and AI, all the players’ skills and abilities will be digitally analyzed and compiled in a database (DB). The database will be built out using block chain technologies and offer a high level of objectivity and reliability. An online platform in collaboration with soccer game companies around the world. In addition to the leagues and tournaments hosted by WSC, use of the platform through peer-to-peer (P2P) will be available. 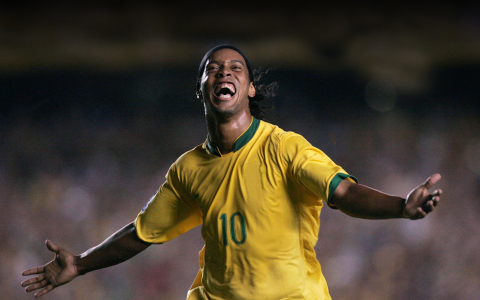 Events hosted by famous soccer players such as Ronaldinho will be held. A variety of betting services will be available such as Super League and e-Sports match predictions alongside support for a team and players. A system that is accessible with ease by computers, smartphones and other devices around the world will be developed. Offering high quality programs to promising young players, such as a study abroad program. A payment system with safety and speed will be developed based on block chain technology. This system will become a core service which has worldwide availability and a high level of security. Ronaldinho will participate in this project as a partner. Born in Brazil, he went on to make Barcelona, Paris Saint-German, AC Milan and other places his stage over the years, becoming a superstar in the soccer world. Having retired from his career as a soccer player in January 2018, Ronaldinho has a passion to “offer an environment where soccer can be enjoyed by children all over the world”. He wishes to eliminate a gap in the soccer world, caused by economies and politics, with this project. A part of the revenue from the business will be used for Smile Project. WSC will deliver a new “joy” to soccer for 3.5 billion soccer lovers worldwide through Ronaldinho Digital Stadiums built around the world.